The diabolo is by far one of the most exciting props to watch. The fact that you can throw an object high up into the sky, and then catch it on a tiny bit of string, astounds people! Do please try and learn more than just throwing and catching though! 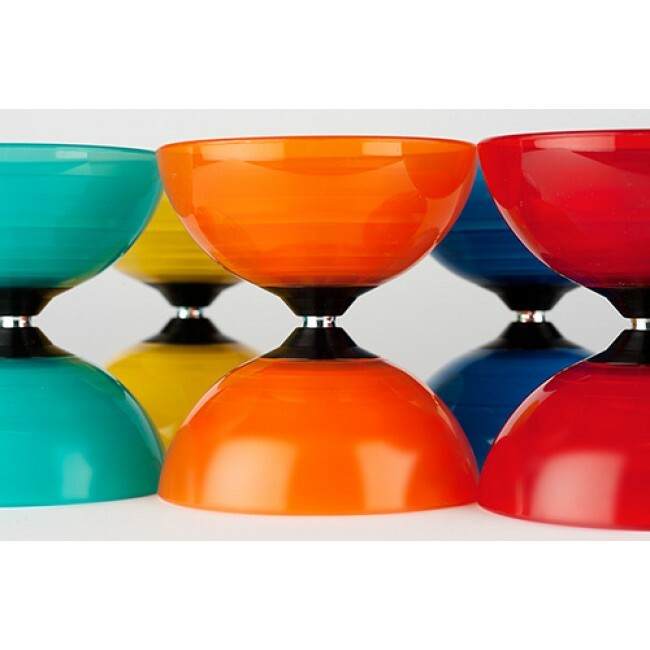 Do not attempt any tricks until you have mastered starting up the diabolo and keeping it spinning smoothly. A lot of people that I teach just try to get the diabolo started and try to throw it immediately, but you need to learn the basics first! So how do I get started then? In order to get to the stage where any tricks are possible, you have to be able to keep the diabolo spinning fast and smoothly. The length of the diabolo string should be approximately the same length as your arms outstretched. What you need to do is get a diabolo to spin in one direction, so roll it along the ground, and then lift the diabolo off the ground slowly and keep it spinning by raising the stick sharply several times a second (if you rolled the diabolo from left to right, then you would use the left handstick to keep it spinning and vice versa). 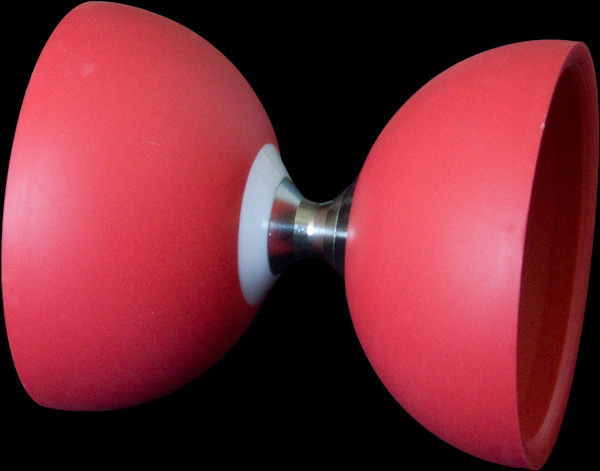 Tilting – You may find that when you are keeping the diabolo spinning, it starts tilting towards you or away from you. This means that the handsticks are not parallel to each other, so you have to move one handstick either towards or away from your body (while keeping the diabolo spinning fast) to correct the problem. You will have to experiment to see which way to move the handsticks to solve the problem, but it will soon become easy to remember which way to move the handsticks! Throw and Catch TO THROW: Start the diabolo up and keep it spinning, then lift your handsticks up and at the same time pull your handsticks apart (so that the diabolo leaves the string and flies straight up in the air). 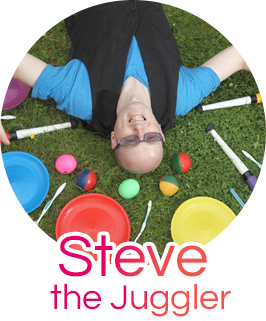 TO CATCH: Once you have thrown the diabolo, you need to raise the handsticks and string up to above head height. This allows you to look through the string and line it up with the falling diabolo axle (the middle bit)! When the diabolo lands on the string, lower the handsticks and get the diabolo spinning fast or do another throw! You have more room for error in catching than you may think, as you can see from the pictures of the diabolo’s on this page that you don’t need to catch it exactly on the axle, as the cups slope towards the middle, so you have a good few inches on either side of the axle to try and catch with! Over the Foot There are many body moves, where the diabolo jumps part of your body. The easiest is over the foot. You start by putting your foot on the string, and toss the diabolo from one side of your foot to the other, then let the string slacken so that the diabolo can roll under the foot on the string, then you can repeat the over the foot trick again! Trampoline Once you have mastered the throw and catch, you can then try to bounce the diabolo off the string instead of catching it. Keep the string tight when it lands, and push the diabolo straight back up in the air again. Remember that the diabolo will slow down while in the air, so you may need to stop doing this trick after a few bounces so that you can speed up the diabolo again. Skipping / Pirouette etc You can throw a diabolo very high, so be careful that you have no roofs or trees to near you, as the diabolo may get caught! Also make sure that there is no-one too near you that may get hurt. If your throw is off by a few degrees, the diabolo could land anywhere! While the diabolo is in the air, you have a good few seconds to do some tricks (pirouette, gymnastics, use the handsticks and string as a skipping rope etc). The limit is your own imagination and dexterity! Need for Speed There are many ways of increasing speed for your diabolo. The method I use is called the horizontal power whip. Get the diabolo spinning using the normal method, then pull the right stick out to the right, then swing it back to the left so that the string hits against the diabolo axle. Keep doing this and build up your speed and intensity. If the diabolo looks as if it is tilting, then stop and correct it. Grinds Slightly toss the diabolo straight up in the air. Point your right stick inwards and keep it horizontal. When the diabolo falls, catch it with the horizontal stick. Diabolo should spin on the stick (this is known as a grind). Because the stick is horizontal and the diabolo is still spinning in one direction, you then have to adjust your horizontal stick accordingly to keep the diabolo on the stick! Alternatively, you could make sure that the diabolo rolls back onto the string ready for your next amazing trick! Whip Catch As soon as you throw the diabolo high, you need to quickly pass the handstick from your weaker hand to your favoured hand so that they form a €œv € shape in your favoured hand with the string dangling down in a loop. As the diabolo comes down, you catch the diabolo using a whipping motion. One side of the loop has to hit the axle (middle part of the diabolo), and the other part has to miss and go past one of the two bowls (the end bits of the diabolo). This trick takes a fair bit of practice, but you can start by just holding the diabolo at arms length in front of you with your weaker hand, and attempting the whip catch. People love this one! All you need to do is get your diabolo spinning fast and wrap around the axle with your dominant hand’s stick, then hold the string vertically (pull the string tight), and the diabolo will climb the string. If the diabolo isn €™t spinning fast enough, then it may run out of power as it climbs, so quickly unloop the handstick so you can do the next trick or spin the diabolo faster! Start by performing a standard trapeze (Swinging the diabolo over the stick so that it lands back on the opposite string, then insert the free hand into the loop caused by the cross over on the other string and pull them apart. This will form the cradle to catch the diabolo on. To escape simple flick off or tip your sticks inwards and the string will slip off the top of the handstick. J-Whip You will have to practice getting a lot of slack round the stick and catching the loop on the front cup of the diabolo. point the dominant stick in towards the diabolo then make a slight tug on the dominant stick which should bounce the diabolo slightly into the air. then make a clockwise motion with your dominant hand, this should bring the loop round. all you have to do now is aim so the loop catches the front cup of the diabolo. C-Whip This is just a different way of doing the trapeze which is done by putting the dominant stick on the opposite bit of string. then make a swinging motion so the diabolo, which is now on a loop, flies over the handstick. all you have to do now is catch it on the string. to do the C-whip point the dominant stick in towards the diabolo and make an anti-clockwise whipping motion. the loop will come round the stick and you have to make the loop hit the axle, pull down and twist the dominant handstick. you now have the C-whip!